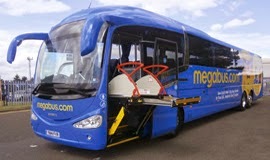 The UK's first 15-metre overall length Scania Irizar i6 coach is set to enter service later this month when it embarks upon long-term trials on a megabus.com route. The initial trial will run for six months, during which time the vehicle is to be based at Stagecoach's Rugby depot and will operate on routes across the UK. Based on a Scania K 410 EB 6x2 4 rear-steer chassis, the vehicle features Scania's 13-litre DC13-115 engine, which complies with the Euro 6 exhaust emissions standard using Selective Catalytic Reduction (SCR) only. Power output is 410 horsepower at 1,900 r/min and the unit delivers 2,150Nm of torque at 1,000 - 1,300 r/min. Transmission is by way of Scania's GR875R eight-speed gearbox with integral retarder and Scania Opticruise fully-automated gear selection system. The vehicle is also equipped with Scania's C200 OnBoard fleet management system. "The initial trial will run for six months, during which time the vehicle is to be based at Stagecoach's Rugby depot and will operate on routes across the UK." ... Hmmm, I wonder if this will operate services such as MP2 and MP3 which work from Hull towards East Midlands Parkway station, via York? I would like to see it do so, not least because I'd like to see it try some of the tricky corners in the city! As a driver for MegabuPlus working out of Hull it would be nice to see this coach working the MP1,2 & 3 services but I'm not holding my breath. The two places such a lengthy vehicle would struggle is the coach departure point in the Hull Interchange and the stop at Scunthorpe Tescos. However there are alternatives in close proximity so.....bring it on!